People push a car that got stuck in snow from a weather system being called the "Beast from the East" in Rochester, United Kingdom, on Feb. 27, 2018. LONDON (CNN) - Britain was hit by heavy snow and sub-zero temperatures Wednesday as the "Beast from the East" brought chaos to the country's infrastructure. 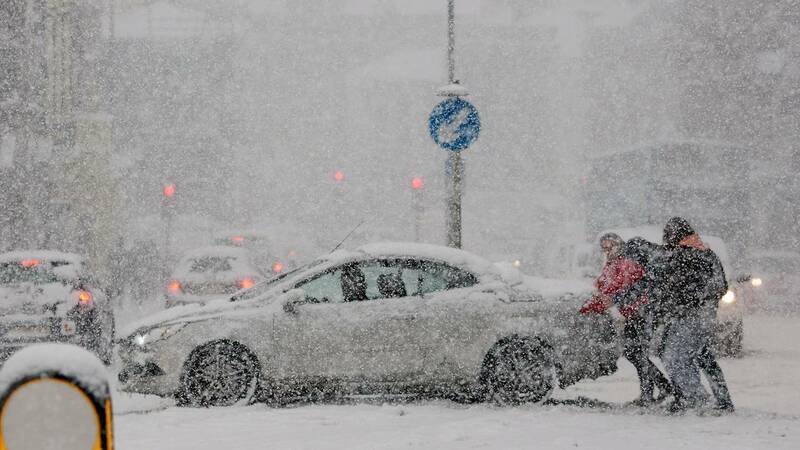 The cold snap, which has chilled much of Europe, left Britain blanketed in snow, forcing hundreds of schools to close and leaving the country's transport services and motorists facing severe delays. The freezing winds swept across Europe from Siberia. Rail companies have warned customers that their trains could be delayed while several services across the country were canceled. London's Heathrow Airport tweeted that it did not expect significant disruptions. Several roads across the country are closed, but northeast England, Kent and East Anglia are the areas that are worst affected. The RAC breakdown service said it was "experiencing a high demand" for its services. According to the UK Met Office, freezing winds from northern Scandinavia and northwest Russia will mean temperatures will struggle to get above 0 degrees Celsius (32 degrees Fahrenheit) during the day and plunge as low as -8 degrees Celsius (17 degrees Fahrenheit) at night. More snow is expected Thursday and Friday. "This spell of weather is the coldest parts of the country have seen since at least 2013, and there is the potential for disruptive snowfall in many parts throughout the week. Transport disruption is likely in areas with significant snowfall and the cold could have an impact on people's health," Met Office Chief Forecaster Laura Patterson said in a statement. "Low temperatures mean snowfall is likely to be powdery, bringing the risk of drifting in the strong easterly winds. The areas affected by snow will vary from day to day and so will the areas at the risk of major impacts. "With the weather so severe at the moment it is really important that everyone keeps up to date with the forecast and warnings in their area, check for local travel information and follow the advice of local authorities and emergency services." While the cold snap has brought much of the country to a standstill, some people decided to enjoy it. Sledders were out in force, while even the freezing temperatures could not persuade one daredevil from grabbing their surfboard and catching some waves.